In this 2006 masterclass, watch Sid Jacobs demonstrate the real depth and importance of guide tones for building strong solo guitar arrangements, counterpoint, comping and improvising melodically strong single note melodies. 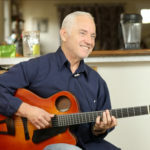 Sid Jacobs shows the connection between Bach and Charlie Parker’s sense of harmony while taking notes from Bill Evans and Lenny Breau. Discover how to use lush voicings and to get beyond using drop-2 or drop-3 voicings. 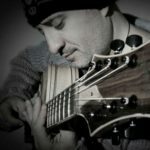 Sid shares his insights after studying and arranging music over many years so that you too can stop thinking like a human capo. You will see how to start combining a musical view of voicings, guitar friendly counterpoint and a melody chord approach that uses guide tones to create beautiful voicings. This masterclass will provide much food for thought as well as plenty of musical examples that you will able to dig into. There’s a wealth of knowledge from Sid Jacobs in the entire session. This masterclass is well suited for intermediate and advanced jazz guitarists who know about guide tones but may have not fully examined the depth of it all. With the newly segmented videos, you’ll be able to locate specific examples easier for repeated study and analysis when needed. 13 Pages of PDF materials in standard notation and TAB. I’m giving this a 5 star rating because of the content. Although the sound was a bit off, which was somewhat distracting, the material was outstanding. It as if I was let in on some of the big secrets that are self evident to great jazz guitarists, but are hidden behind clouds for many of us. This is the kind of lesson that will absolutely improve my playing.